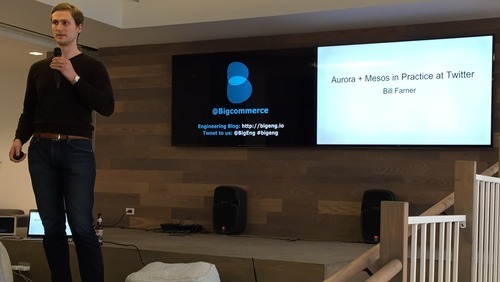 This week we hosted Bill Farner and Maxim Khutornenko from Twitter in our San Francisco office to speak to our engineering team about Aurora and Mesos. Bill and Maxim both work at Twitter and lead the Apache Aurora project. Aurora is the platform that almost all of the production critical services and caches run at Twitter, as well as internal services and cron jobs. The powerful combination of Aurora and Mesos have made it easy and cheap to deploy services at Twitter (it’s essentially their own internal PaaS). It took them about 4 years to go from “Hello World” on Mesos to fully migate all of their production services to Aurora. The big takeaway, for me, was that Aurora has unlocked the engineering team at Twitter to have self-service access to computing resources, while still providing stability and uptime.